It’s often a surprise to see a desk so affordable to have really great specifications and features like the ApexDesk Flex. As a mid-priced desk, the ApexDesk Flex stands above most others, quite literally when it comes to the maximum adjustment height, and it has other features that make it a strong competitor of even the most high-end standing desks. 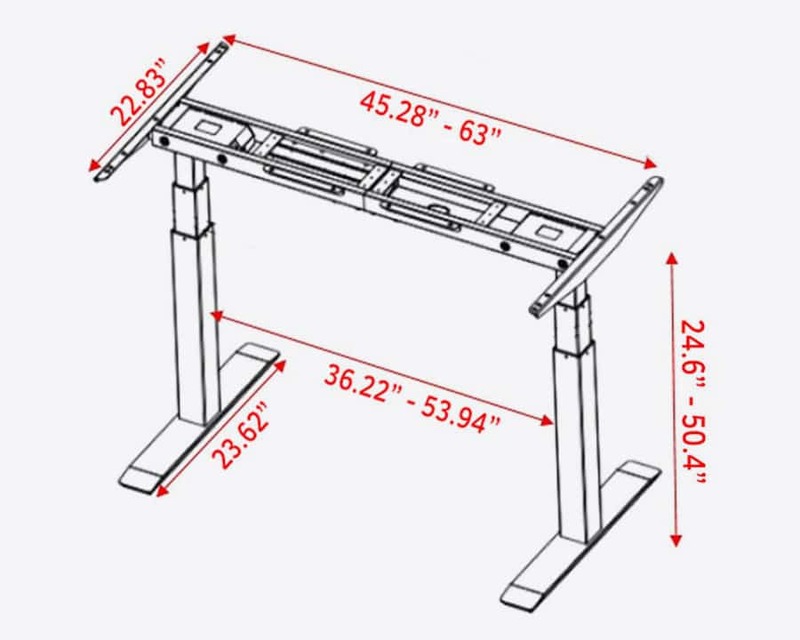 This product comes either as a full desk including the base and the desktop, or you can also find just the base available on Amazon if you’re feeling like a bit of DIY and have a desktop that you want to repurpose. The only real drawback I can see after extensive research is a comparatively low warranty period when compared to other products. That said, given the quality of this frame and desk, we’d hope that warranty wouldn’t be necessary at all. Let’s take a deeper look, shall we! BEFORE YOU GO: make sure to have a look at the best standing desks on the market! 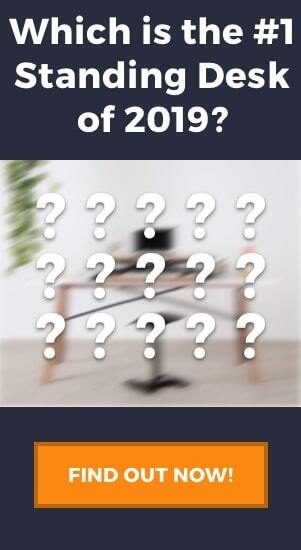 After much research of over 50 standing desks, we have compiled our top picks of the year. Check it out here. The standard dimensions of the ApexDesk Flex. Perhaps the biggest selling point of the ApexDesk Flex Desk Frame is its mid-range price tag. 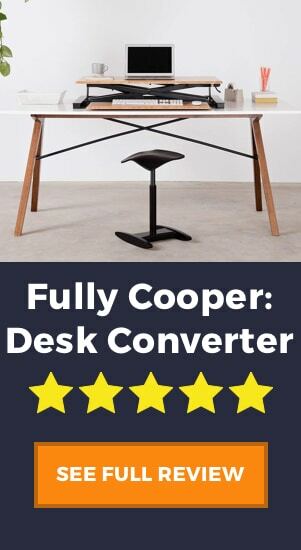 For anyone who wants to switch to standing desks, this is practically a steal. All that’s needed is your old desktop — or make a new one yourself with a little bit of DIY. Or if you don’t want the hassle then get yourself the frame and desktop combined. How much are you saving, anyway? For comparison, the award-winning table from NewHeights Levante will set you back nearly quadruple the price of the ApexDesk Flex. 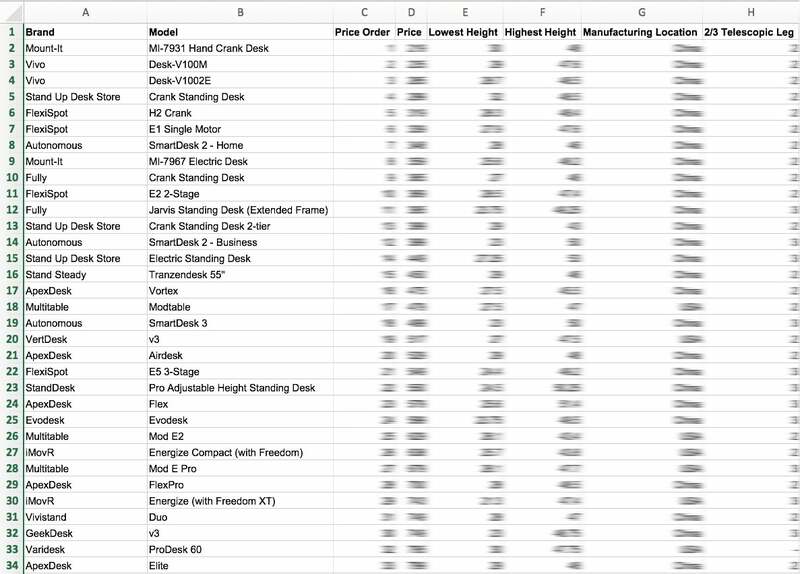 To be fair, there are cheaper desks like the Vivo DESK-V102E that will cost you under $300. However, we have to acknowledge that the ApexDesk Flex Desk has a set of features that are better than others in its category, which we’ll get to next. Desk frames need to be as sturdy as possible. Apart from being the foundation of the desktop, it must also withstand the weight of all the items to be placed on the desk. Thankfully, the ApexDesk Flex is made out of solid steel, keeping it as stable and durable as possible. It has a maximum weight limit of 225 pounds, which is nearly 50 more than the 176-pound capacity of the Vivo DESK-V102E. The recommended width of the tops you want to pair it with is 47 to 78 inches, but the frame is strong enough to accommodate other sizes — just remember to balance the weight. Furthermore, the solid steel legs utilize two handy features: telescopic height adjustment and leveling feet. The former helps carry the rugged legs from a low of 24.6 inches to as high as 50.4 inches, and that’s already the height without the desktop. You can comfortably add an extra inch with a nice think desktop and this desk would be able to compete with some of the tallest standing desks on the market. On the other hand, the leveling feet are your simple solution to unstable surfaces. These will keep the height adjustable desk stable to prevent your valuable items from falling. The ApexDesk can be bought as a full unit or just as an adjustable height and width frame. What powers this standing desk is its dual-electric motors. These are responsible for the optimal height adjustment settings. And while these are electric motors, the noise output won’t cause you any troubles. 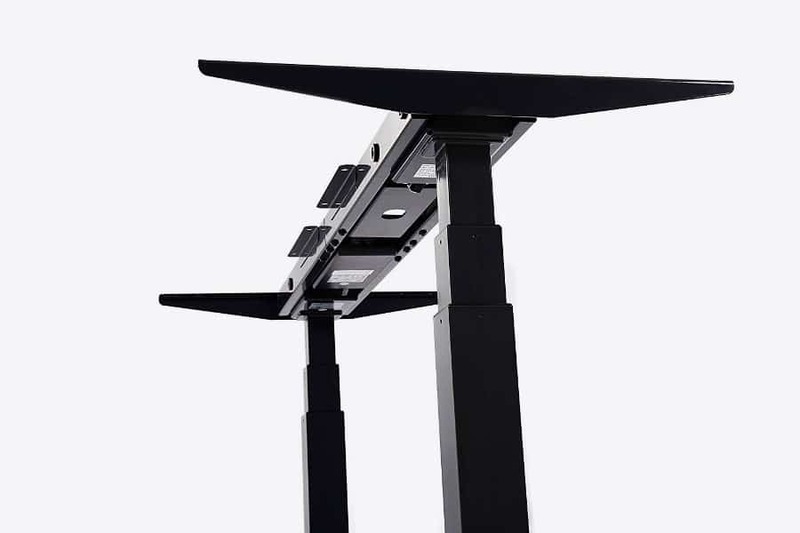 The ApexDesk Flex motorized standing desk will capably lift your standing desk to your preferred height without much noise, less than 50 dB according to the manufacturer. This allows you to switch from a standing desk to a sitting type anytime without disturbing anyone else. The dual motors can adjust the height of the desk at 1.5″/second, which is on par with the likes of the Fully Jarvis and 50% faster than a similar desk, the FlexiSpot E1. And speaking of switching positions, you can do this with one push of a button found on the memory controller. 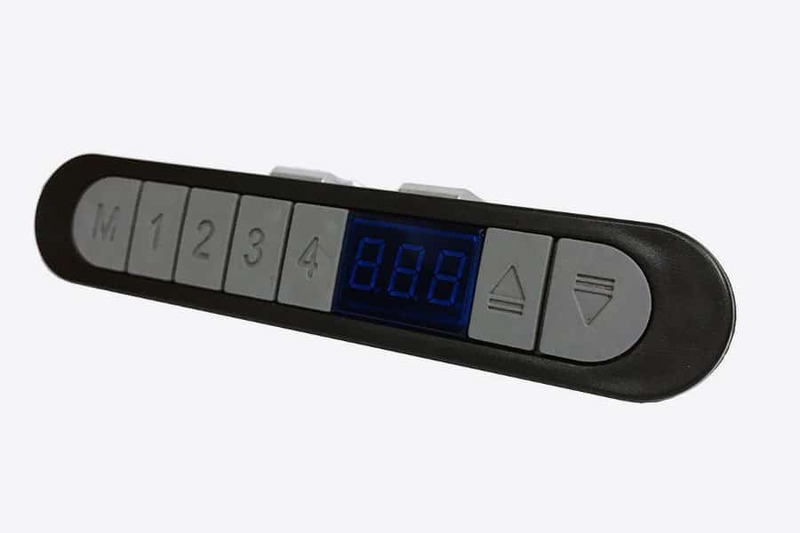 This handy controller works with the dual-electric motors to help you assign up to four different height settings, saving you time from manually choosing new settings each time. The memory control pad is quite commonplace among standing desks these days, but the benefit of the ApexDesk is that it comes included in the price and not as a paid addition. Speaking of adjustments, the frame not only is height-adjustable but also width-adjustable. From just 45.28 inches, the frame can expand to as long as 63 inches. Although this maximum width is not the best among all desk frames, it certainly outshines others. Many people prefer having this option as opposed to something like the Varidesk ProDesk 60. While still a very good desk the width is set and can be a limiting factor for some people. A closer look at the controller. This electric standing desk frame does not come pre-assembled, but that’s not a big deal as among all the desks we know there are very few that do. The instruction manual is well-written, so much so that beginners can follow it without seeking technical assistance. In more or less five easy steps, your new standing desk is ready to go. Assembly usually takes only between 15 to 30 minutes, and it’s great that they’ve included some screw anchors. Getting your desktop attached to the frame itself could take about another 30 minutes as you set the right width and fasten everything together. All in all, you can get things running in just an hour. Of course, the look itself matters to people. Unlike the typical sitting desks, the legs and the overall frame of a standing desk are more visible when in use. This is why color and appearance matter. Thankfully, many will appreciate the minimalist and clean design of this desk. The frame is completely black, which should either elevate or complement your desktop. A top of the same color gives your standing desk a unified look. On the other hand, a white or light-colored wooden desktop works well to contrast the dark base and legs. Furthermore, a functional yet aesthetic feature of this ApexDesk Flex model is the memory controller. It sports a black outline with buttons in gray. And apart from helping you set your preferred height settings, it has a small LED display to give you measurement details. If you buy the ApexDesk Flex with the desktop, you can choose from black or the nice wooden finish as seen here. The ApexDesk Flex has a lot going for it, but one thing it doesn’t have are ergonomic areas for organizing cables. Most people will be using their standing desks to use a laptop or any similar gadget, so it would’ve been helpful if there was a way to keep all the cords neatly stored somewhere. One solution to this is to get a zip tie, which costs just about five dollars. It should only take you half an hour to arrange the cables along the desk frame. Alternatively, you can buy desk accessories from the ApexDesk website, and the cable management trays will set you back around $40. While its general stability cannot be denied, it is worth noting that the desk frame does show minor signs of movement if you set it at its maximum height of 50.4 inches. There’s practically no harm to this, so you shouldn’t worry if the frame moves ever so slightly. Even if you place three computer monitors on the desk when the frame is at maximum height — its solid-steel construction and generous weight capacity will keep your devices safe. This is a complaint that is quite common amongst all tall desks that above a certain height it is hard to keep them 100% steady. Even the Jarvis, which is one of our favorite desks, has had some issues with top-end stability. 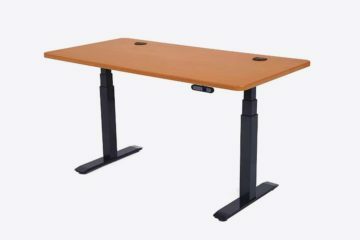 ApexDesk does provide the materials for assembling the desk frame and attaching it to the tabletop, including the screws and the screw anchors. However, these tools aren’t always going to be useful for attaching the desktop. The instructional manual does recommend using the screw anchors included in the package, but it’s not actually a good idea if you’re going to use a top made of medium-density fibreboard (MDF). Using them for MDF desktops could lead to warping or slight deformities. And while ApexDesk was kind enough to include screws, they won’t work well for certain desktops. 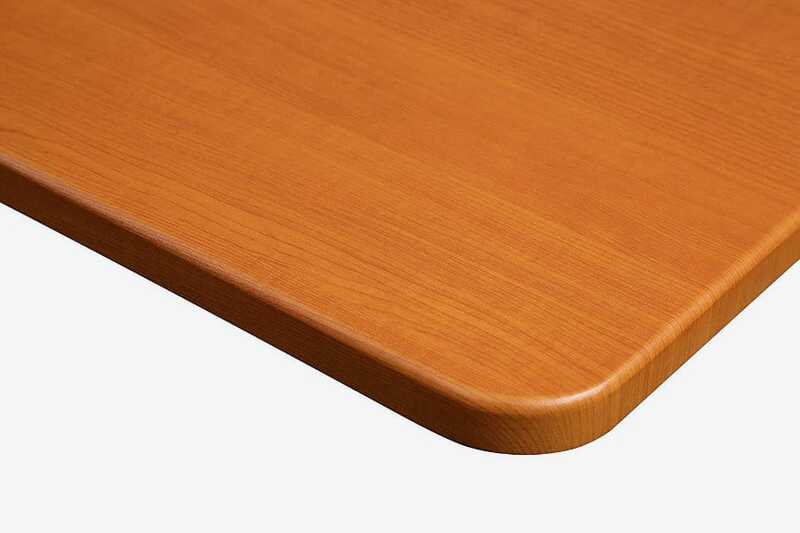 In particular, the dense tabletops need sturdy screws between 0.5 to 0.75 inches in length. Otherwise, you might have trouble keeping the base and the top firmly connected. This is obviously more of an issue if you choose to only buy the desk and use your own desktop. If you use the ApexDesk desktop you shouldn’t have these same issues. Now that we’ve laid down the pros and the cons, the question now is whether the ApexDesk Flex is a good choice for you or not. The first thing to consider is whether you need the frame or the whole desk. Do you already have a desktop waiting to be attached to the frame? Or perhaps you’ll construct one with the materials you have — getting a desk frame alone should save you more money than buying an entire standing workstation. Now that we’ve laid down the pros and the cons, the question now is whether it is a good choice for you or not. The first thing to consider is whether you need the frame or the whole desk. Do you already have a desktop waiting to be attached to the frame? Or perhaps you’ll construct one with the materials you have — getting a desk frame alone should save you more money than buying an entire standing workstation. Overall, the ApexDesk Flex achieves what it set out to do. It is good as a frame and it is good as a full desk. The best factors in our opinion are the ease of setup, which by all user accounts seems to be better than average, the adjustable width and height match desks of double or triple the price, and construction of the frame, the electronics, and the motors is all of good quality. If you are particularly interested in ApexDesk as a brand, we have also reviewed their Elite desk which I think is another great product. Slightly more expensive, the Elite comes with a few additional features and is just overall a more robust desk, so if the budget allows I definitely recommend checking it out. Although in saying this, we have given the ApexDesk Flex a higher rating overall due to the cost/benefit ratio being better in our opinion. After suffering from many injuries and pains throughout years, Nick started Painless Movement with the hope of helping others discover ways to live a healthier, happier, and pain-free lives. Although not a doctor or physiotherapist, Nick uses personal trial and error and anecdotal experiences to learn about the body and hopefully provide useful information for others who suffer from similar health issues.